This autumn punch will be the hit at your next Halloween gathering. Simple to make and kids will get a kick out of the bobbing shrunken heads. Credit goes to Queen-Events-and-Consulting via facebook. Brilliant, I say...Just brilliant. (Did I mention you can add spiced rum as an optional ingredient? Peel apples and cut each in half through the stem; remove seeds and core. Using a sharp paring knife, carve a face, as desired, on the rounded side of each apple half. (SeaWitch note: Don't let the carving out a face scare you...the more unflattering the better). Place apples in lemon mixture for one minute; transfer to paper towels to drain. Place apples, face-side up on prepared baking sheet and transfer to oven. Let bake until apples are dry and begin to brown around the edges, about 90 minutes. Remove apples from baking sheets and press cloves into the "eye" sockets. Combine cider, lemonade, and rum (if using) in a large punchbowl; float shrunken heads on top. Can't believe that August is nearly over and the end of summer isn't far behind. I'm looking forward to fall. It has been a very long, and very hot summer for most of the country and here in the south, it's been oppressively hot. It will be wonderful to have cool nights again where we can turn off the AC and open the windows. I miss hearing the sound of the birds, the tiny but extremely noisy tree frogs and the rustle of the leaves as the wind gently blows. Got lots to do in the next 6 weeks as I prepare for my knee replacement surgery. 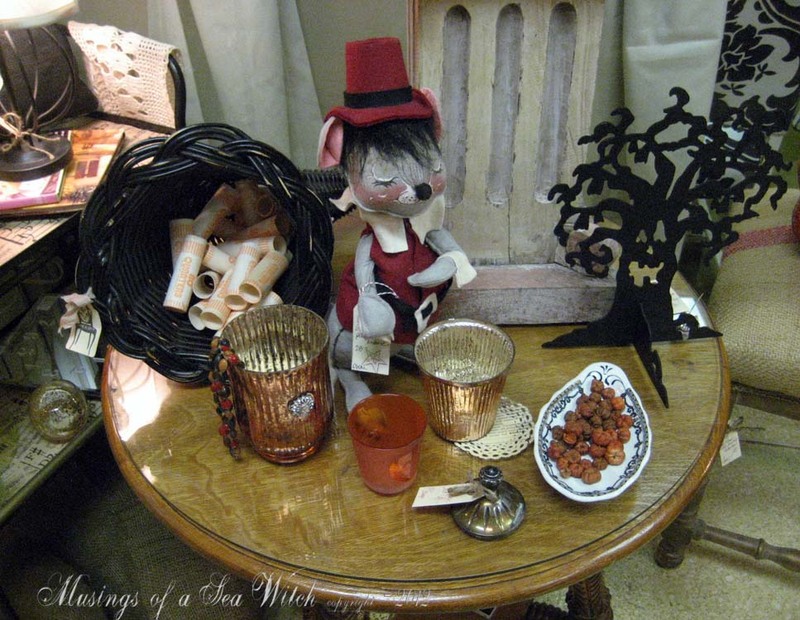 Have to get my booths ready for Fall, Halloween and Thanksgiving as I will be a sea witch out of water with a laid up tail for about 6 weeks. Found some unique pieces this weekend. Practically, lept out of my vehicle when I saw this marvelous chip carved/pyrography small table/stand from the early 1900s. Signed and beautifully decorated, this is a terrific folk art piece. The artist covered every exposed inch of this table. Unfortunately, there is a missing table at the bottom where the pieces cross. Still, it doesn't detract. Closeup of the top of the table. Marvelous patina. Closeup of one of the legs. So much work was put into this piece. I hope it finds a home that will truly appreciate it. I would find these in the midwest, but this is the first time I came across a salt glazed Hull pitcher in Atlanta on one of my treasure hunts. Heavy with a pair of cows on both sides, this pitcher would hold cold milk, or buttermilk straight from a local farm. I think it would look pretty hold fresh cut sunflowers or bittersweet. How cute is this little oil cloth pumpkin head doll? Paid $1.81 for this sassy face at my local Goodwill. Another cute folk art doll, all handmade, is this Halloween kitty cat. Yup, from my local Goodwill and $1.81. 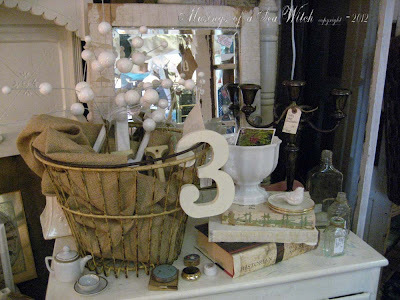 My first display of fall items along with an antique, brown glazed canning pottery jar that I found at one of my favorite haunts. Found a pair of these shoe forms and added pretty copper ribbon bows to them. Sweet little brown sponged, yellow ware bowl. These are fun to fill with natural berries and a pillar candle. Very heavy, antique, cast iron string holder. 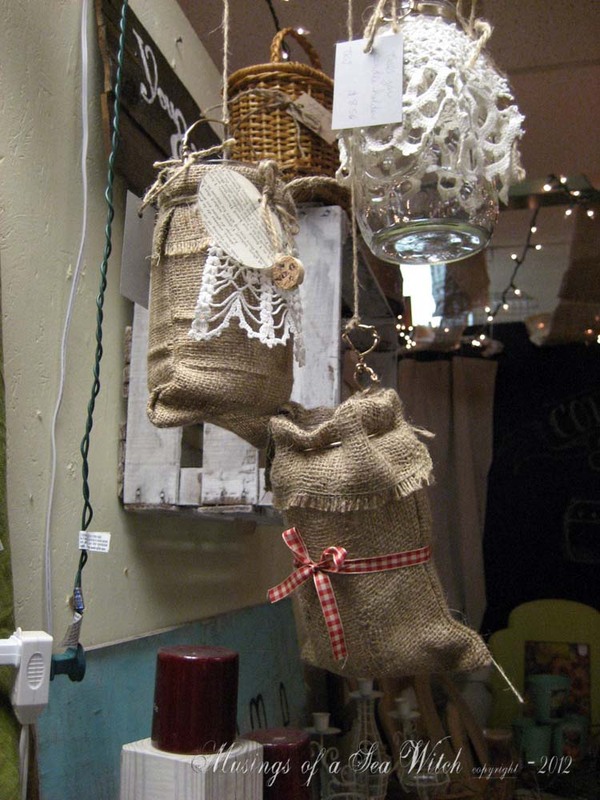 I love these items and they are perfect for dispensing Christmas ribbon. A terrific find. 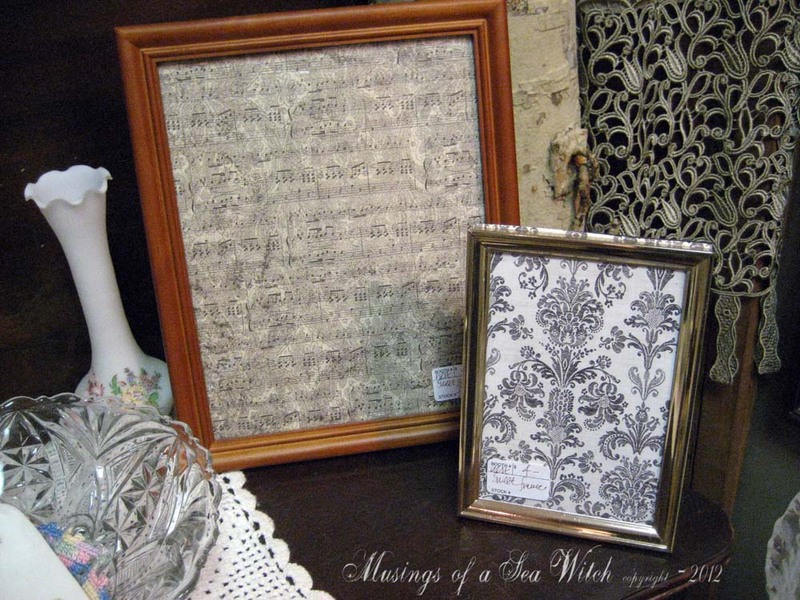 This pair of large, wooden frames will be perfect for my Halloween cabinet cards. Not old, but a very large and heavy blown glass container filled with spiced pine cones and a scented pillar candle. I paid pennies for it and still had the original price tag of $40.00 on it. I don't think it was ever used. Pretty, antique cast iron trivet. Nice turn of the century piece. Nice little set of four bowls and six dessert plates of vintage china. 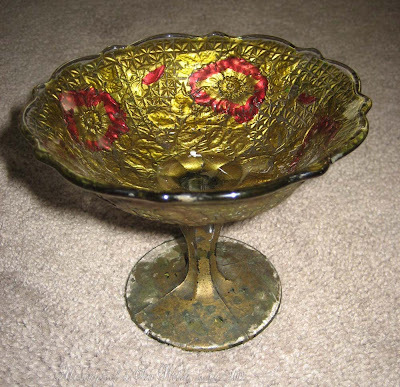 Gold lustre trim and pretty violets makes this a sweet find for $3.00. Circa 1950s. Despite the record summer heat we have had this year, I'm slowly falling into fall and so are my favorite haunts. Smatterings of autumn are creeping up from the tips of the trees changing color in the parking lot of my local supermarket to introductions of those warm and cinnamonie colors and scents in my favorite places to look for treasure. 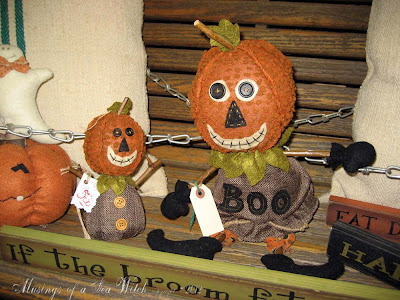 How about this cute pair of pumpkin heads for your mantle? Vintage Village in Snellville has got the autumn colors showing up everywhere along with dealers bringing in more new items each day. I'm already looking forward to their Candlelight Walk in November. 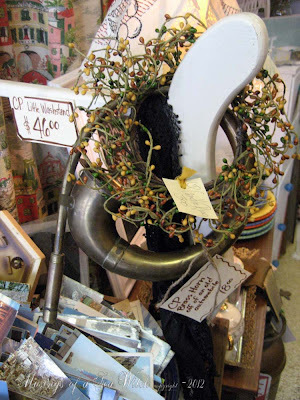 Love the decorative whimsy of an antique car horn, fall berry garland and some black lace. 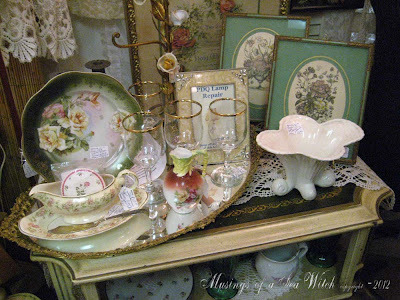 A "Carla-ism" from Carla of course at Vintage Village. She always has interesting things and I usually want them all. A wooden bowl brimming with soft, fall colors. Each little space is a vignette of decorative delight. 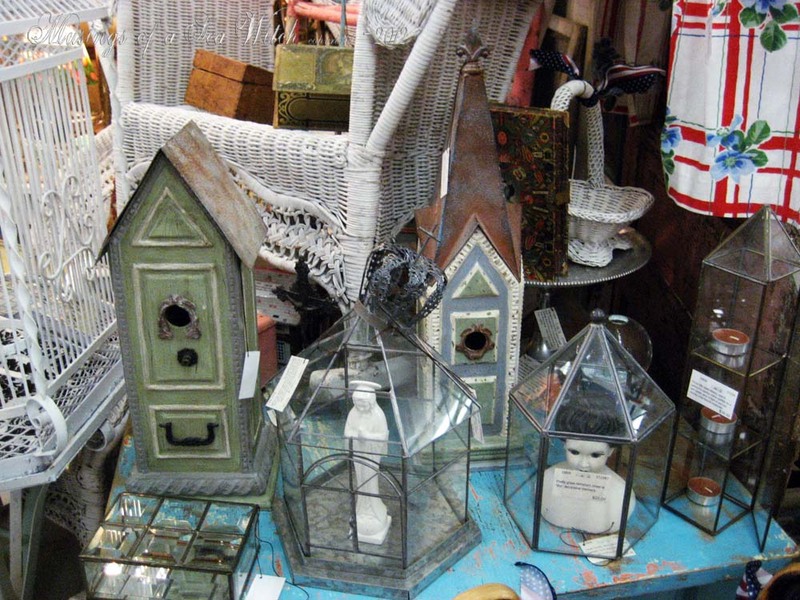 One of my favorite dealer's (and gal pal) booth called "The Fox Hole". She always has the prettiest and chippiest things. I still have my eyes on a pair of old prints in massive gold frame. Guess what caught my eye on this table? Give up? Well, it is the black cornucopia filled with coin holders. Now that's a cornucopia of "plenty." Paul and Jeanine's both is always so pretty. 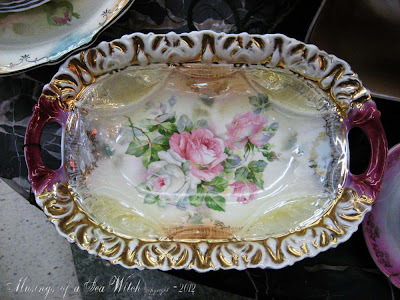 I also purchased a marvelous Victorian serving bowl with beautiful cabbage roses and gold lustre trim. That photo is farther down in this post. This display made me smile. 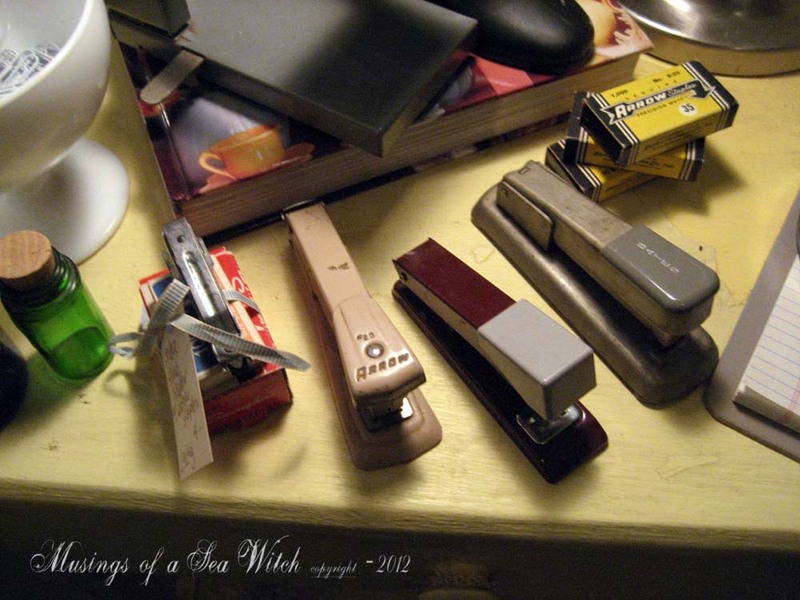 Staplers of all sizes are just fun and they give you "power" over your life by allowing you to bring organization to your paperwork. Okay, and you can pound the table ones pretty hard so it purges those aggressive tendencies one often needs to let go of. Sometimes you just want the frame so why not forgo a photograph and just frame pretty paper. I thought these little burlap sacks over mason jars holding candles was just too cute. I bet the candlelight through the sacks is pretty. 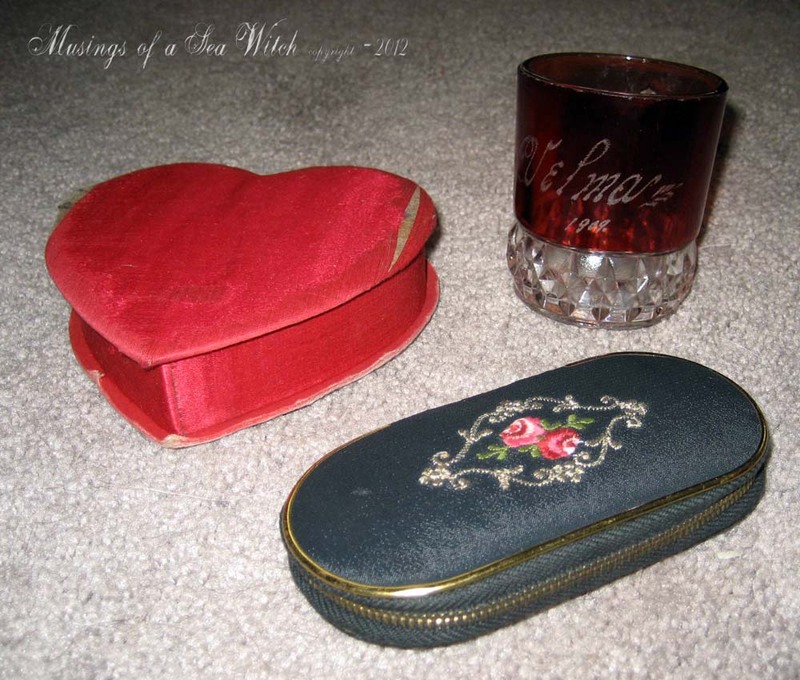 And now to a few of the treasures I found this weekend. Sweet little Goofus Glass compote. I've been putting together a nice little collection of Goofus Glass for my booth this Christmas. These pieces look so pretty with vintage mercury glass ornaments and Putz houses in them. 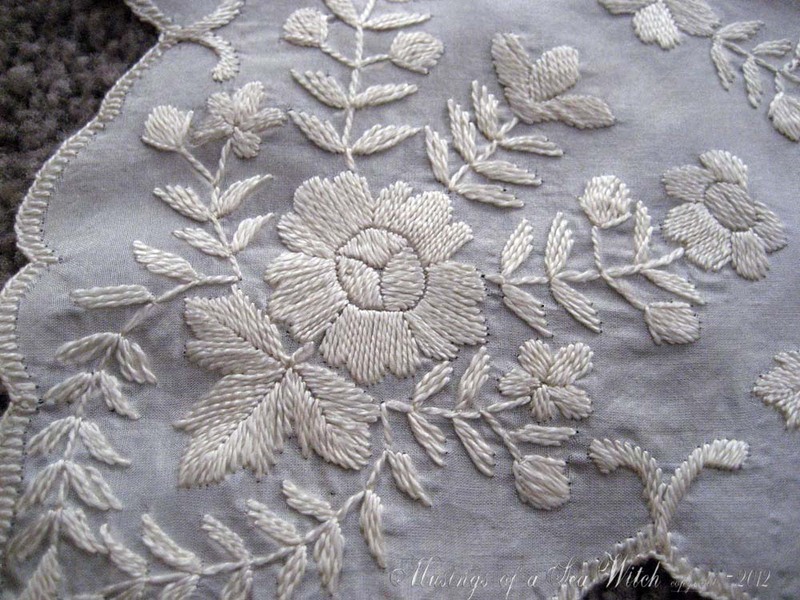 One of my passions, beautifully executed, hand embroidered white work from the Edwardian era. This silk beauty is in perfect condition. Close up view of the beautiful hand stitching. 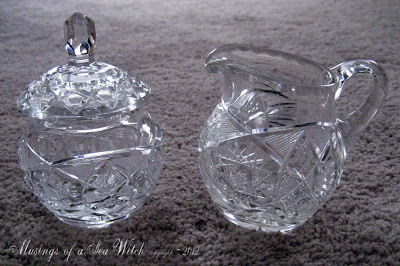 Sweet little pair of cut crystal and very heavy sugar and creamer. I'm keeping these babies. 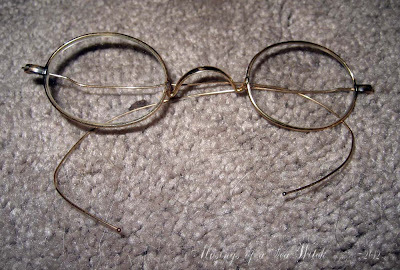 Gold framed with readers I can actually use. LOL. 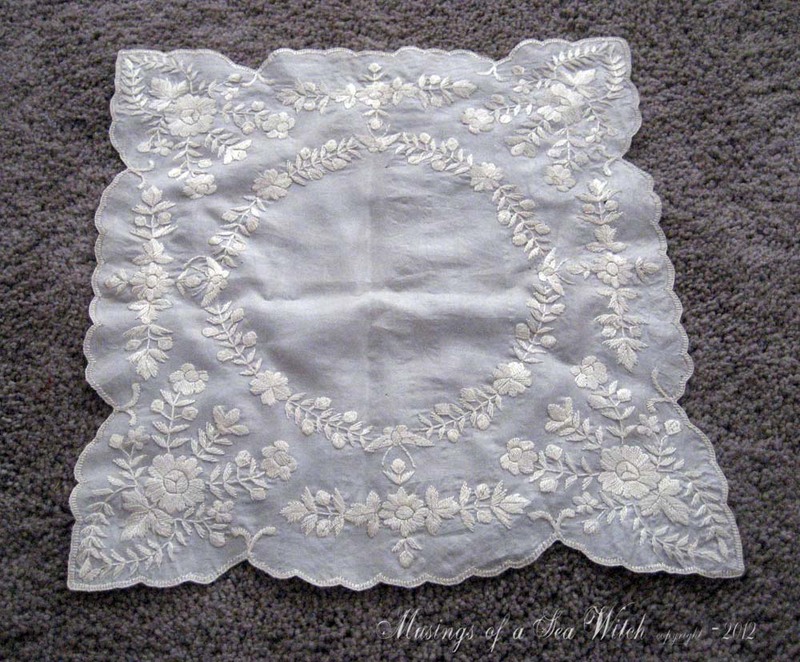 I'm becoming my great grandmother - "Grandma-nana"
Love the shape of this quad piece and the beautiful initialing on the base. Sweet little selection of items. My favorite, is the souvenir ruby flash glass with the name, "Velma" and date "1909" on in it. Could this have been Velma from Scooby Doo's mystery machine epi where they go back in time to solve the mystery? Who knows, I just love that owners name is Velma. 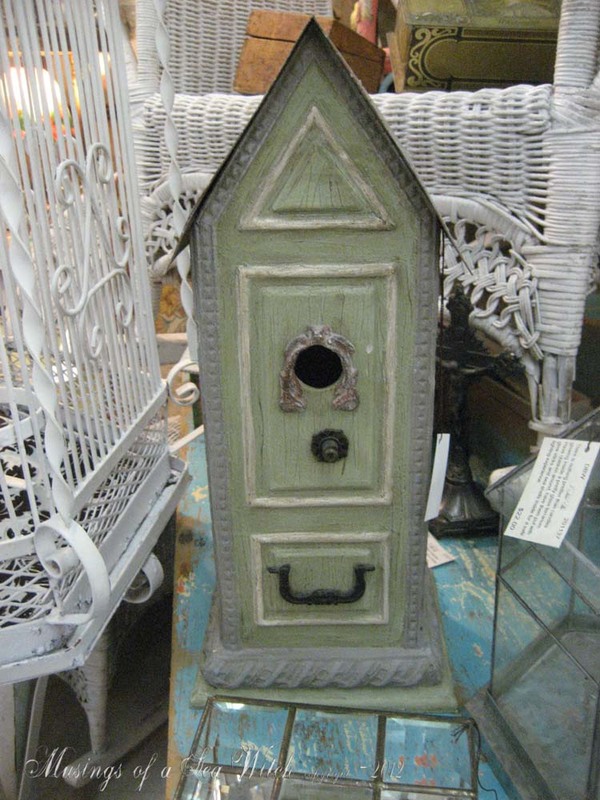 Found a pair of these pretty decorative bird houses. I have both nestled around the glass terrariums. 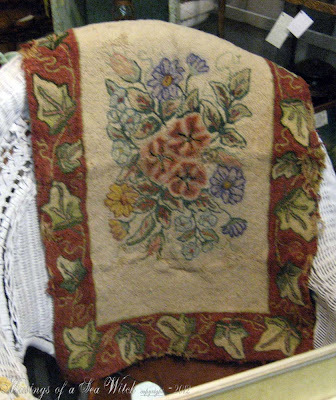 Love this pretty little but rode hard and put away wet hand hooked wool rug. It has issues, but I don't care...we all do. 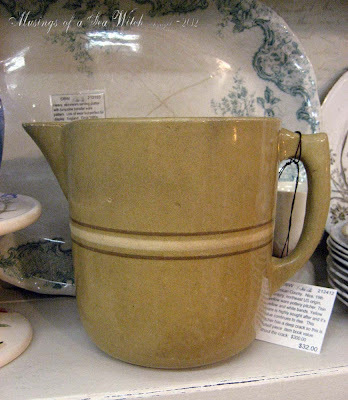 Believe it or not, this beautiful yellow ware pitcher was a Goodwill find for $2.32. 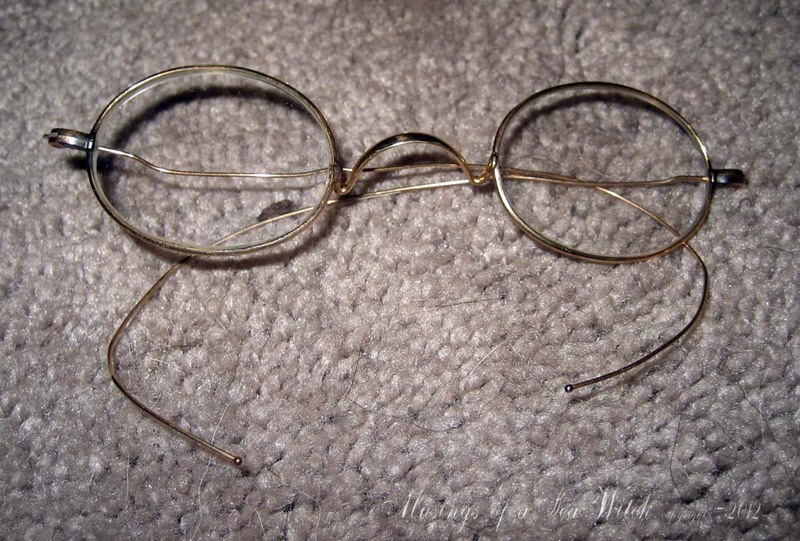 This 19th Century piece has all the right buttons and whistles but with one major problem...a large, deep crack down one side making it useless for "use". Still, it is a terrific piece for a collector on a budget who doesn't have the deep pockets for $200 but has $32.00 and the smarts to recognize a marvelous piece of antique yellow ware pottery. 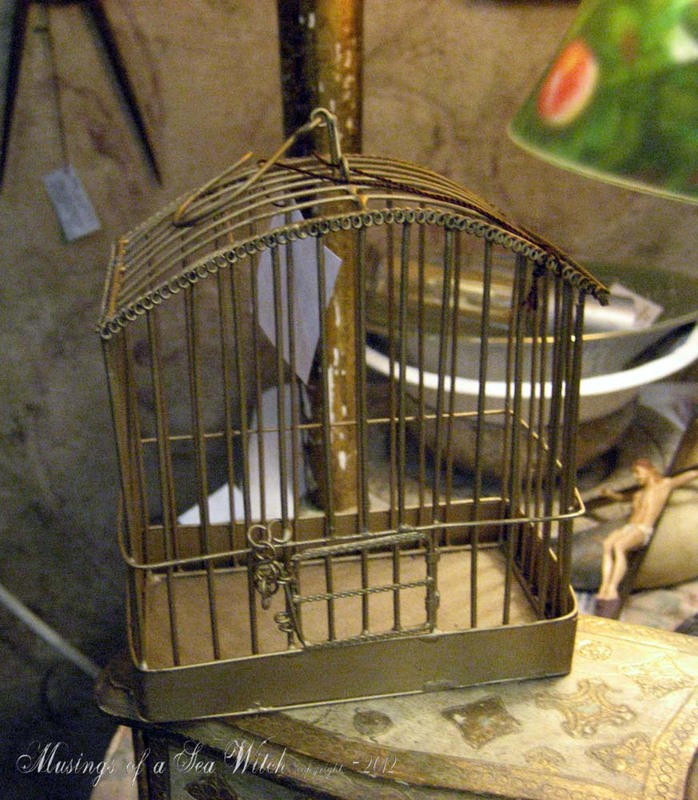 I can see it filled with sprigs of American Bittersweet and on a mantle, shelf or table. 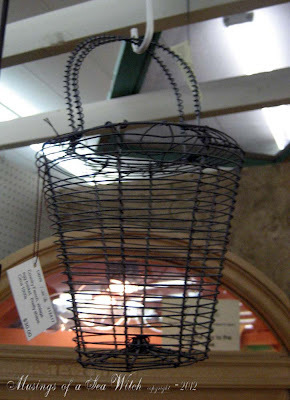 I love the unusual shape of this vintage wire egg basket. A little research and it appears to be a french piece. These are marvelous as a decorative base for Christmas and Thanksgiving decor...or as intended and filled with eggs. I love make-do. They just delight me and this sweet little bird feeder of galvanized containers is too cute for words. 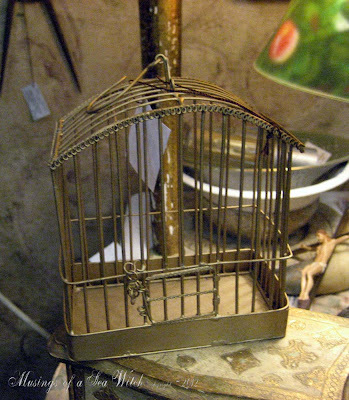 I would put votive candles in them and hang this from my patio umbrella for soft golden light. Yes, this is that beautiful late Victorian serving bowl I purchased from Jeanine and Paul's booth. 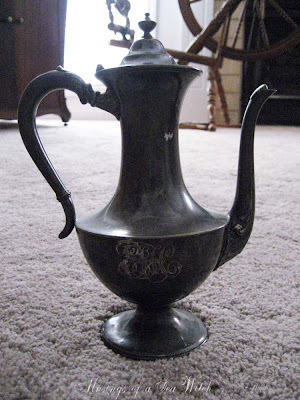 Exquisite and the oval shape with handles is just delightful. Aghhhh, it was just too short a weekend. It flew by...way way way to quickly. It was a nice weekend, nothing out of the ordinary...ran around with sis on Saturday, did a little junkin, found a few treasures, had lunch with sis and we laughed until we ached and then laughed some more. Caught dinner and a movie with my honey and watched athletes win Olympic medals. Any way you look at it, it was lovely and that is why I didn't want it to end. So I write this post at 9:41 pm, before I get ready to pack up my laptop bag for work tomorrow, finish up laundry and then call it a night. Not a lot to select from this Saturday's pick. It happens and probably because everyone was out shopping for school clothes since we had a tax free weekend. Still what I did find I was very pleased with. Found this lovely french 2/3 yard long print from 1894 called String of Pansies that was beautifully framed and mounted on a secondary frame background of pale yellow velvet. Very 1950-1960s. Normally, I would reframe this type of antique print so it was in a period frame, but this contemporary framework is first class and really showcases the print so I decided to leave it as is. This is the second week I have found a pretty wool needlepoint and petite point picture. Lovely needlework. A few pieces of antique Wedgwood soft paste from 1897-1901. A lovely set of the same antique Wedgwood of a deep saucer and double handled bowl for broth or tea. Here is the find of the day. Actually a pair of these marvelous engravings by Thomas Nast for Harper's Weekly. This one dated 1897 and beautifully framed. The second engraving is of Boss Tweed and dated 1870 also by Thomas Nast for Harper's. Sorry about the photos for this post. I forgot my camera and had to use my iphone. 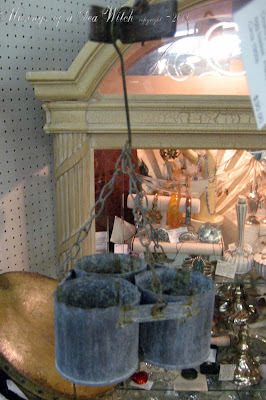 A pretty vintage, Newport Silver candelabra that unscrews at the top and becomes a single candlestick. Two antique silverplate serving ladles. A lovely little gravy/sauce piece that is from an obscure silver manufacturer (Plymouth Silver Co) and a big, soup/punch ladle from William Rogers. 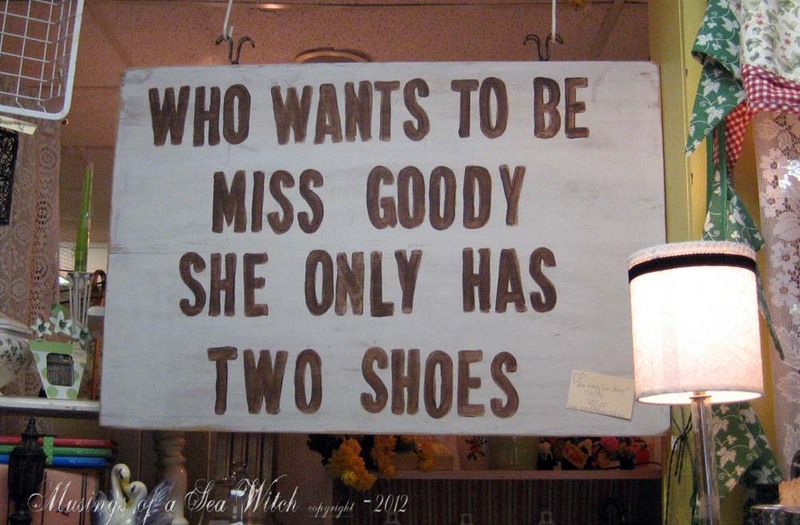 Both are highly decorative. Pretty little antique plate with a transferware picture of Marie Antoinette. A pair of turn of the century cut crystal decanters. 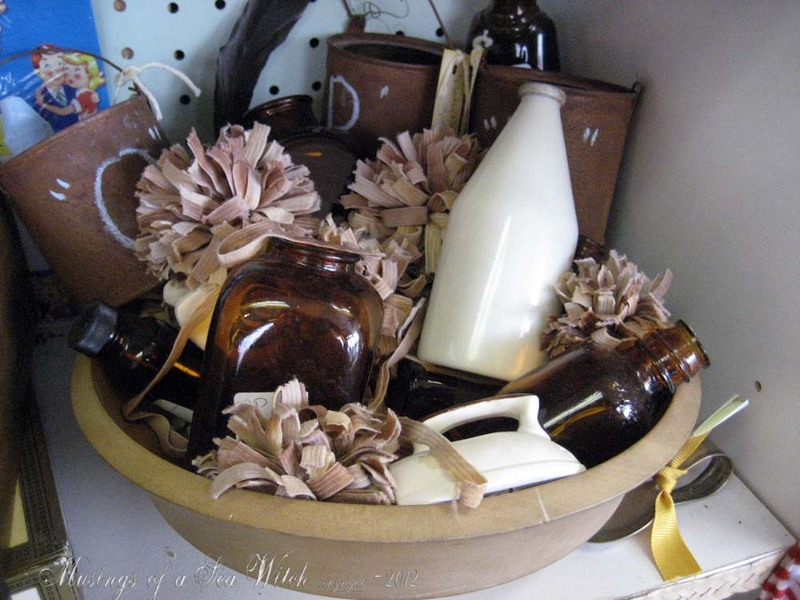 They have a delightful shape with pretty toppers and look like an I Dream of Jeannie bottle. The one bottle was wearing a pewter, Steiff sherry tag. I priced the Sherry tag separately and put it in my locked showcase. This type of item tends to walk if you don't lock it up. 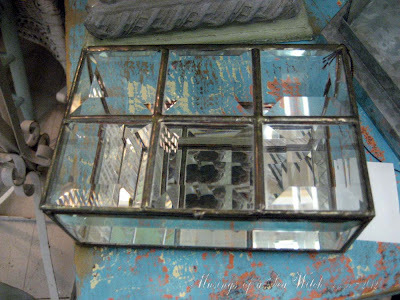 This was a find from last weekend when I visited the Flowery Branch Antiques Market. Beautiful, hand knitted/beaded late Victorian bag. Found this at my local Goodwill for 88 cents. Love these pretty little things. This was my big find at Flower Branch. A huge and very heavy, silverplate over copper footed serving piece. 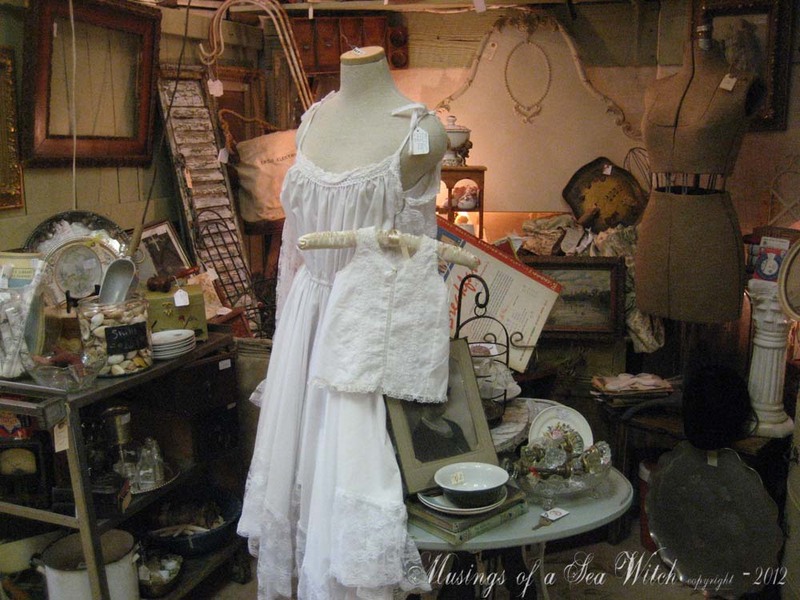 Late Victorian, it was filthy and black and filled with Civil War shot and a baseball sized cannon ball. I offered the dealer $15.00 for it and they sold it to me because they didn't think it would clean up. It cleaned up beautifully and had 90% of the original silver. Can you see the dent in it? That is wear the Civil War cannonball sat for years accordingly to the dealer. The ball fit in the dent beautifully and no matter how much I begged, they would not sell me the cannonball.